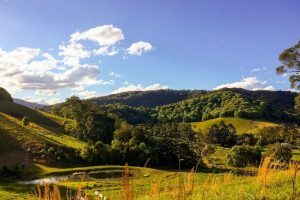 Take retreat in the beautiful Byron Bay Shire, at the stunning organic farm, Wybalena, immersing in 7-days of Yoga, Pranayama, Meditation, incredible food, long walks in nature and so much more. All enquiries for retreat via email for information or to reserve your place. Limited spaces. The seasons represent the ever changing cycles of nature, with the rhythm of life. The laws of nature, 5 element theory and Ayurveda all speak of the natural laws and the affect of these upon our energy, our organs, systems and functioning, our emotions, our health and wellbeing. Intensive week is a focussed time for you to immerse in yoga and meditation practice. It is not at all intense, and caters for all levels of ability. Intensive week consists of early morning class for 5 days with seasonally specific asana, pranayama and meditation. At each intensive, the body receives renewed energy to align and balance itself with the season. The yoga practices nurture and harmonise you with the governing season. The yoga practices are designed to allow the organs to heal and function well. The becomes body cleansed and refreshed. The mind becomes calm, and settles with stability. Everyone is welcome, suits all levels and abilities. Attendance with Booking, which includes a valuable resource Ebook: seasonal theory, correspondences, ayurveda, student notes, nutritional guidelines, lifestyle tips for best results and delicious seasonal whole foods recipes. Bookings are essential for these inspiring and popular courses. Seasonal intensive week is like a mini retreat without the airfare! Autumn Intensive: the metal element (lung and large intestine meridians). Date: 15th – 19th April 2019. Time: 6am – 7.30am. Venue: Avalon Beach Surf Club (ocean front room). Theme is let go – release body, stale energy, old patterns and negative habits. Align with natures contractive energy for toned body and improved breathing. The time to open and heal lungs, improve chi flow, elimination and trim down. Gain focus and clarity. In Autumn we organise our lives and create healthy boundaries. Feel the benefits of Let Go in mind and body. Winter Yin Immersion: Deep dive into the water element (kidney and bladder meridians). This Yin immersion is scheduled over 2 weekends, 2 hour practice on each day. Dates: June 2019. Times: 1pm – 3pm . Venue: Avalon Yoga Coop. Theme is stillness. The water element is deep energy, it seeks to settle with confidence and stability within ourselves and structure. In this season we restore, conserve and contain energy with yin practices for the purpose of rejuvenation and deep healing. Yoga at this time addresses the spine, neck and low back, creates hormonal balance, sexual energy, longevity and conservation of essential life force. Contained with our inner warmth and joy. Restorative yin yoga, pranayama and stillness meditation relieve the effects of stress and adrenal exhaustion. Spring Intensive: the wood element (liver and gall bladder meridians). Date: September 30th – October 4th 2019. Time: 6am -7.30am. Venue: Avalon Beach Surf Club (ocean front room). Theme is Detox. Spring is the time to turn over a new leaf with a good spring cleanse. Spring is a time of change and new beginnings, in yoga we refresh and renew energy and outlook, with detoxifying practices and diet change to create lightness in body and mind. Summer Intensive: the fire element (heart and small intestine meridians). Theme is radiance – heart opening and core strength. Summer is the yang season, it’s expansive energy is expressive and creative. Power, communication, relationship with ourselves and others are heightened now, for greater joy, compassion and connection. The new year marks a new beginning, the opportunity to begin afresh with health and life enhancing choices that support you in the year ahead – a yoga cleanse to start the new year fresh, light and open hearted. Set your own pace with one on one private yoga sessions.